1. Preheat the oven to 120°C, gas mark 2. In the meantime, make several incisions in the surface of gammon. Place the gammon into a deep roasting tray or flameproof casserole dish, then pour in enough cold water to cover the gammon. 2. Add the apple juice, cider, cinnamon stick, garlic, cloves, star anise and orange zest. Cover the pot with foil and place on the hob. Bring to a simmer, then transfer to the preheated oven. 3. After about 4½ hours, remove the tray from the oven and allow to stand in the liquid to cool for up to half an hour. 4. Meanwhile, make the glaze. Place the maple syrup in a pan and heat to 140°C (this will take around 10 minutes). Remove the pan from the heat for a couple of minutes, then add the cider and cinnamon. This will bubble up, so add the cider gradually. Then bring to the boil and allow to simmer until the liquid has reduced by about half and remove the cinnamon stick. Using a hand blender, blitz in the Dijon mustard and mustard powder. 5. 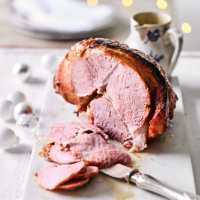 To finish the gammon: preheat the oven to 200°C, gas mark 6. Remove the gammon from the roasting tray, remove the skin using a sharp knife and score the fat. Place on a wire rack with a tray underneath, brush the glaze all over the gammon and place in the oven for 10 minutes. 6. Apply a second layer of glaze to the gammon and return to the oven for another 10 minutes. Remove from the oven and allow to rest for 10 minutes before carving. Serve with some the remaining glaze as a sauce. This recipe was first published in Mon Nov 30 16:20:00 GMT 2015.